So this problem is a little tricky if you do not familar with recursion and stack. I had an answer using recursion until recently I tried to solve this problem again by using a stack. The advantage of using a stack is making the solution pretty neat and clean. However, the disadvantage now becomes of how could we get the idea of such solution. Firstly, let's review the basic concept of binary search tree. In short, the binary search tree is an binary tree with order, by traverse the whole tree, you will get the nodes in order. The traversal is defined how you search the tree, here in BST, we could just use the pre-order traversal. The figure below illustrates a BST and its traversal procedure. For this specific problem, note that, the starting node for the iterator may NOT be the root node! Yes, although it is initialized from the root node, actually the starting node should be the node with smallest value (it's possible the smallest node is the root.) So what is the smallest node in the BST, it is the left-most node. 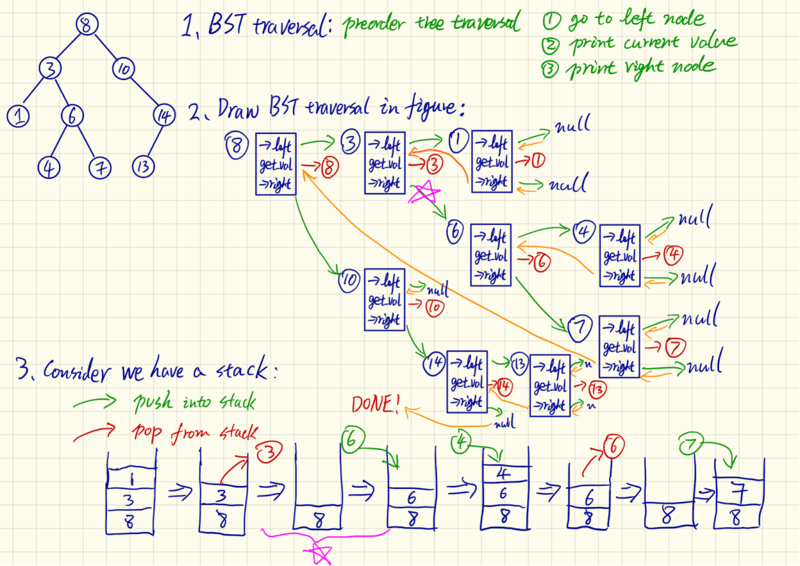 Secondly, I draw the firgure to show how the preorder traversal is done in recursion way. Specifically, in each recursion, we have 3 steps, (1) search the left node, (2)print the value, and (3) search the right node. In the figure, I show the current value and all 3 steps in blue color, this is what actually is stored in the function stack. The green arrow is our function call each time, while the organe arrow is the recursion. The red arrow and number is getting the node value. keep searching the left node. If we tried to simulate the function stack using a regular stack, we could see from the figure that, green arrow acts like the push to stack operation, and red arrow acts like the pop operation. The property of stack itself servers the orange arrow. It current node doese have right child. Then search up to its parent, until the parent node has right child. The left-most node of that right child is the next node we want. If current node has right child, we keep pushing the left child of that node (include the right child itself). If there is no right child, we do nothing. The top node in the stack is what we want. Why? because once we visited the node, we pop it form the stack, so all the previous nodes are no longer existed in the stack. Your C++ code will give a problem when the question asked on some OJ does include the variables. Rest is really good code. Your iteration takes log (n) foreach step in iteration. 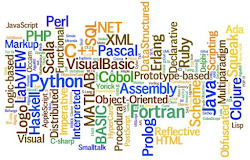 Over all it takes n log n to iterate over all elements. I currently have several intern openings for deep learning and computer vision. This is an internship for both research and development. You will have opportunities to publish high level papers in computer vision and deep learning, or develop cool real world AI application if you prefer more for coding! If you have experiences in deep learning and computer vision, and interested in this intern, please send me your resume by email (xperzy AT gmail DOT com) with subject "CV intern". Copyright © 2012-2014 Yu's Coding Garden - All Rights Reserved. . Awesome Inc. theme. Powered by Blogger.